Ezra Furman’s rise to prominence stems from some hyperbolic words from Michael Hann. His five star review of Day of the Dog, where he proclaimed the record a “genre classic…that never feels like an exercise, but a living breathing piece of self-expression”, gave the band the success they enjoy in the UK. And those words aren’t unfounded, nor are they better written than Ezra Furman’s lyrics. Ezra Furman and The Boyfriends are not the most compelling live act you can see right now as Hann and Raymonde of Bella Union assert; that accolade belongs to either Eagulls or Fat White Family (I can’t decide). However, they are not too far from the mark. Furman’s energetic stage presence, contained by his Boyfriends’ harmonies, manages to channel a deeply visceral performance into an oddly youthful, danceable rock and roll. The performance seems devoid of a tired punkish swagger you’d expect, which is replaced by a playful vulnerability, but sometimes the cheery chords and saxophone chic seem far too Radio 2 at drive time. That last one is probably just me. Perpetual Motion People contains the sardonic commentary and 50s revivalism seen in Day of the Dog with a similarly visceral delivery. The record seems warmer and at times Furman more confident of himself and his beautiful brand of nihilism (see ‘Hark! to the Music’s joyous calls to “dig out your souls”). ‘Restless Year’ is a great opener. Here, Furman acknowledges his change of standing from relative outsider to revered artist. ‘Lousy Connection’ projects Furman’s worldview atop his new found pedestal, lamenting culture, society and such (side note: declaring “This century seems like it’s turning out okay/it’s like a game of worldwide karaoke” seems somewhat ironic if your record is reciting a lot of the fifties, but then again, he is doing it well). Elsewhere, Furman’s lyrics come from a reflectively personal place. ‘Pot Holes’ is a brilliant assessment of his home town, its poverty and its racial divides, delivered through a barrage of brass and Eddie Cochran-era harmonies. But the record flits to introspection with almost every other track. ‘Can I Sleep in Your Brain?’ deals with isolation by at first adhering to melancholic clichés then building into a closing fortissimo. Segments of the record leave you wondering if Furman’s production has become somewhat more polished. The first two glossy tracks seem like they have benefited from more time in the studio, but then tracks like ‘Tip of a Match’ ignite into a chaotic frenzy of grainy synth chords and noisy riffs that could easily come from Neutral Milk Hotel. Analysing any Furman record renders an Eddie Cochran or, really, any 50s rock and roll/RnB group reference unavoidable. One Guardian interview listed Frankie Lee Sims and Chuck Berry as his influences among others. In a way, what Furman’s music does to that era of rock and roll is similar to what LA Confidential does to film noir; the genre is excellently revived in a manner that just resists a simple pastiche. 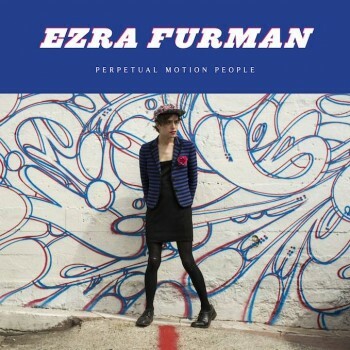 With Perpetual Motion People, Furman continues to impress, though worthy of less hyperbole.